At Van Isle Marina, we are Western Canada’s yachting experts and the region’s exclusive authorized dealers of Riviera, Belize Motoryachts, and Back Cove Yachts. If you are looking to buy or sell a boat or yacht, you have come to the right place. Looking to buy a boat? Our team of yacht sales brokers is ready to help you find the best recreational vessel for your needs, whether that be a new or pre-owned yacht, superyacht, megayacht, sporting yacht, sailing yacht, motor yacht, or cruiser. When you’re ready to buy a yacht, the process typically begins by talking with an experienced broker who can discuss your wants, needs, and budget. Here at Van Isle Marina we have a team of three brokers in our Yacht Brokerage Department who are highly experienced, prepared, and enthusiastic to connect buyers with the right boat. Van Isle Marina specializes in both new and pre-owned boats. We work closely with our clients to get to know them and understand their needs and wants. We then set out to find them the right boat that is going to check all their boxes. If we don’t currently have what you’re looking for moored at our docks, we will search high and low to find you exactly the make and model you’re after. Van Isle Marina is the exclusive authorized dealer in Western Canada for Riviera, Belize, and Back Cove Yachts. 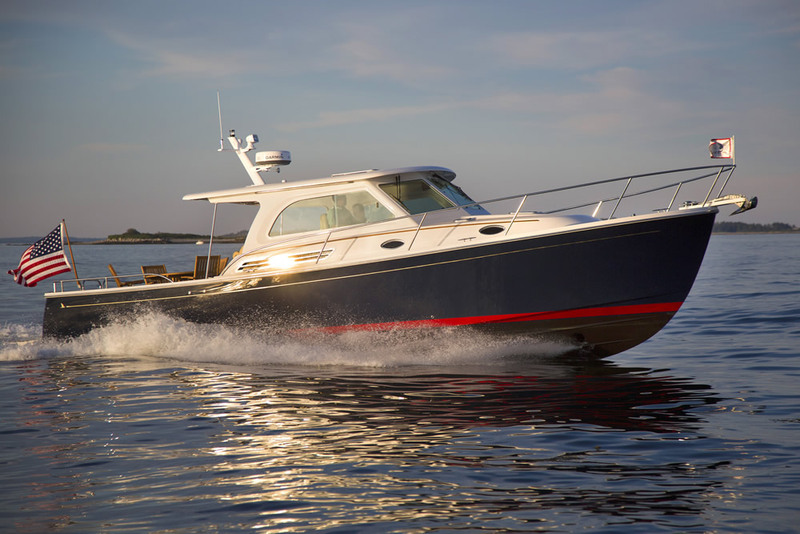 Riviera, manufactured in Australia, has been building world-class boats for more than 30 years. Riviera Sport Yacht, SUV and Flybridge models are innovative and quality-built boats that are professionally finished and equipped to provide an excellent lifestyle for families and friends on the water. Belize Motor Yachts are manufactured and distributed internationally by Riviera and have the soul and style of a heritage vessel, but the advantage of advanced technologies. The Daybridge and Sedan models are now available in North America. 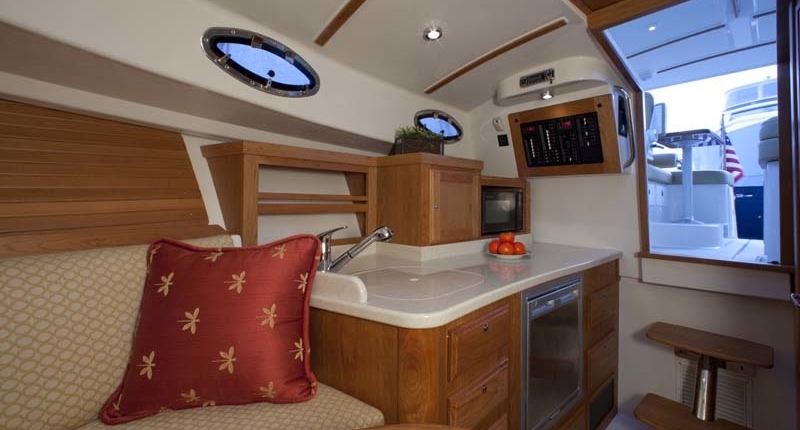 Then there are the practical and elegant Back Cove Yachts that feature ample space in their cockpits and simple, well-designed systems and amenities below. They will give you years of reliable service and immense pride of ownership at a very reasonable cost. We invite you to come and tour our new models to experience today’s finest yachts around. We also have an extensive inventory of high-quality pre-owned power and sailboats on location at our sales dock and throughout the marina. View pictures and specifications of pre-owned boats and yachts for sale and contact our Yacht Brokers for further information. As Certified Professional Yacht Brokers, we are ready to assist you in locating and qualifying for a boat. We will assist you with purchase negotiations from any other location in Canada or the United States. Our brokers want you to feel comfortable and understand all aspects of the yachting lifestyle, including the costs. If it’s your first time buying a yacht, our team of brokers will advise you on the costs associated with yacht ownership, including insurance fees, fuel consumption rates, moorage fees, extended warranties, general maintenance, and crew salaries (if applicable). We can also advise you on your vessel’s resale value. Financing is available through Dealer Finance. Customers are given multiple finance options, convenient ways to handle the paperwork and never have to fit this process into their schedule. Loans are always full disclosure and never have early payout or pre-payment restrictions. When it comes time to sell your yacht, Van Isle Marina can help with that too. Our world-class sales dock attracts plenty of national and international attention from boat owners and yacht enthusiasts for its impressive amount of boats on display, restaurant, and large fuel dock. Our qualified team welcomes the opportunity to market a boat for sale on your behalf using proven sales strategies. Why sell through Van Isle Marina in Victoria? We make the entire process swift and easy and do all the marketing for you. Browse our listings of yachts for sale or contact one of our yacht sales brokers today!